The past quarter has been filled with many ups and downs for Asura World. Starting with a slower than ideal development pace at the start of the year, to seeking further funding, to an entirely new change-up of the Community Center. It is safe to say, we have been feeling the pressure. “I have always maintained the belief that for any business to succeed; a strong foundation will always surpass something rushed. This logic has been applied to our decisions made for Asura World. Community Center v1.0 is what we like to call, the soft launch of Asura World, it allows for basic registration and basic functionalities within a streamlined environment. The focus was on design and has always been on design. We want users to navigate through their preferred, highlighted or most important pieces of content with ease. This phase is off-chain and is built to ease into the eSports media world while v2.0, v3.0, product 1.5 and product 2.5 (see below) are under development. 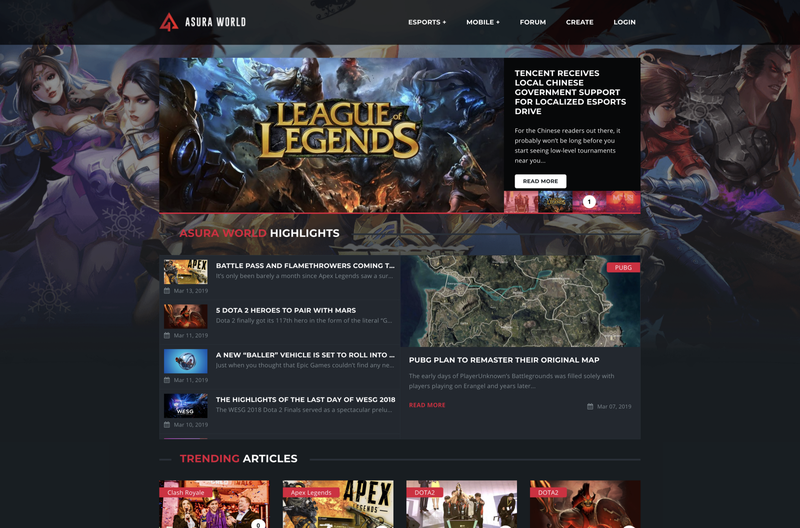 We have included Apex Legends into Asura World due to the recent boom in their reception and highly competitive gaming structure. As always, we’re continuously on the lookout for highly received games entering into the field of eSports. In terms of design and user interface, we have created a different theme for every game. Featuring their unique backgrounds, highlights, and information, title pages will only focus on titles relevant to their genre (e.g. MOBA titles will not recommend Battle Royale titles). Specific twitch streams for each game. Community Center v2.0 is when things get interesting for Asura World. Users may notice the “Create” link in the Community Center header; this function will allow users to directly contribute to Asura World and be rewarded for their contributions. Create original content via the “Create” link and submit the content, submitted content will be published under Original Articles* where anyone can view, users can give any content they enjoy a “Like” , and everyday, the most popular submitted content will be published to the homepage of Community Center, also rewarded in ASA. v2.0 also sees the release of Forums, a more sophisticated user profile backend, a few design updates, and a completely new CRM/CMS backend for devs, publishers, and temporary admins. Community Center v3.0 is what we consider the “finished” product with; migration onto blockchain, wallet implementation, automated reward system for ASA, automated publishing system for content creators, limited back-end access for consistent content creators, and most importantly: AVATARS. From the start, we have stressed Asura World will evolve in the way our users want us to evolve. Self-sustainable and self-functioning is what we consider our end goal. Community Center v3.0 is the final stretch for us to reach that stage for the Asura World Platform. Users will be able to sign up either with a wallet or without a wallet, the wallet will be universal throughout the entire Asura Ecosystem alongside the users’s email address. By v3.0, users will be able to submit any original content, content will be voted by 1 Like = 1 ASA*. Users are encouraged to Vote, as voting will incur tickets for “Asura Holders Draws”, Community Points, and other benefits to be announced in future Progress Reports. 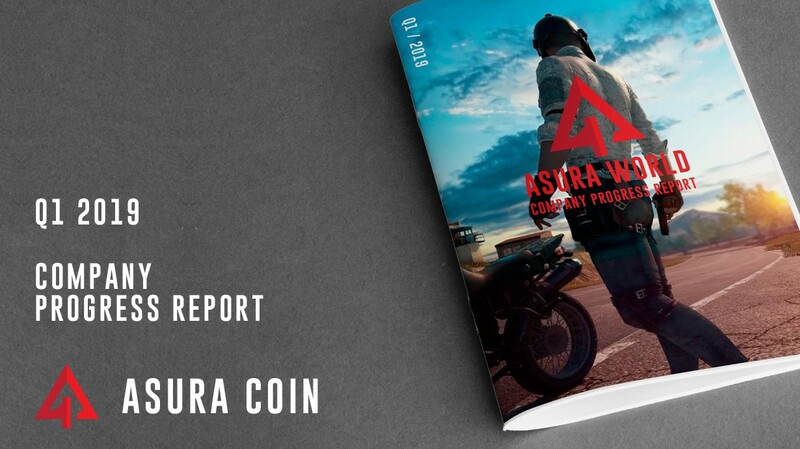 Popular content voted will be automatically published onto the front page of Asura World Community Center where a larger audience presence will be felt, resulting in higher earnings in ASA and Community Points. *Value is subject to change. Asura World will be casting the betting and competitions part of the platform to be owned and operated separately in Curacao while Asura World Community Center, Tournaments, Matchmaking, and Academy will be operated out of New Zealand. This move has been made due to various strategic reasons and will see our betting platform being optimized for the intended use. Introducing product #1.5: ASURA COMPETITIONS & ASURA HOLDERS DRAW. Asura Competitions is a little game we decided to create prior to the major functions due to the incredibly fast turn over, potential growth, and mainly because it’s something we can release sooner for our community to enjoy. Asura Competitions will offer competitors a HIGH return on prizes by limiting possible entries. A vast array of prizes from Quick Cash, to eSport Tournament Tickets, to Computer Accessories. Enter competitions by purchasing a ticket at a very small cost, answer a competitive skill based question and await for the live-streamed draw. An extremely simple concept to promote Asura.bet before the launch of the betting mechanism. Unfortunately, Asura Competitions will be strictly limited to 18+ and there are certain country restrictions. Please refer to the Terms & Conditions on the website for further information upon launch. Users holding ASA are eligible to sign up to the competitions database. Registered users are automatically in the draw to win 5% in cash value after every completed draw, on a daily basis. *, holding more ASA will increase your likelihood to win. More information will be released for Asura Competitions and the Asura Holders Draw upon launch. 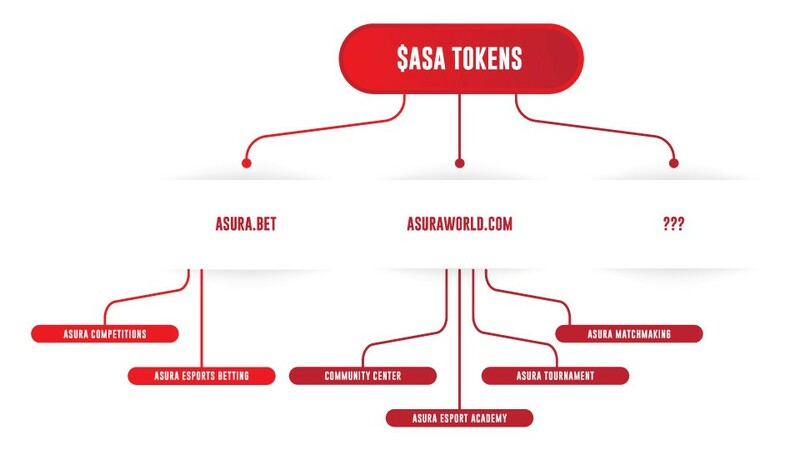 *Subject to change, value subject to change too..
Due to the betting & competitions now being located separately to the rest of Asura World, we needed a network that communicated between the two, thus, we created the ASA Network. The ASA Network is the global network tying both ends of the mechanisms together through ASA Tokens. With a ONE* Wallet policy, users will be able to access and enjoy all the functionalities and rewards of both platforms. ASA Tokens will be transferable from both platforms too. One Wallet policy refers to the matter of using one wallet to access all functionalities. In April we will be updating the entire roadmap for 2019, for now we can confirm the next development mechanism will be: Asura Tournaments. This may come as a surprise to many, as the previous roadmap stated we were releasing the betting platform next. We will be developing both Tournaments and Betting both simultaneously however, by pushing Tournaments, we will gain access to certain markets and expand Asura World sooner for Q3 and Q4. In contrast pushing our Betting product without having a polished Tournament product will slow growth for Q3 and Q4. This way forward will also allow us to integrate onto blockchain much faster too! Please check back here for the updated roadmap in the coming week.